Shoot me an email to t[email protected] subject ComixLauncher 15 and ask me something. You’ve gotta have something you’re wondering… and chances are someone else is wondering it to. 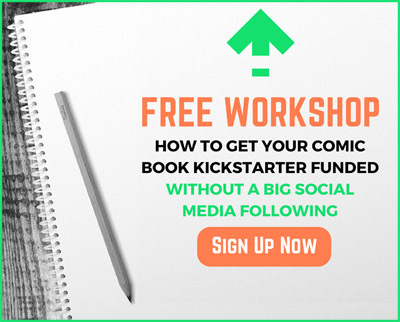 ComixLaunch host Tyler James is interviewed by Walter Haas of Kickspy, in an effort to uncover the secrets of successful Kickstarter projects. I have a very special interview for you today… in the hot seat getting interviewed is a creator who has successfully run 7 Kickstarters and raised nearly $170K on the platform… you may have heard of him… his name is Tyler James. Now, before you think I’ve gone crazy and I’m interviewing myself on the show, or that my ego has super sized, let me tell you what’s up with this week’s session. A few weeks back, I was contacted by a gentleman named Walter Haas, a mathematician in San Francisco and who’s been studying successful Kickstarter projects for the past few years. For a while, he ran a site called Kickspy.com analyzing Kickstarter projects. While Walter is primarily focused on the quantitative research side… he now wants to focus more on the qualitative side to balance out his knowledge of the platform. As such, he’s talking to successful KS creators, seeking to pick their brains, similar to what I do in my interviews with creators, trying to find the mindset, strategies and tactics that lead to success. So, he asked if I’d talk to him… I agreed, on one condition… that I could record the interview, for the benefit of YOU, ComixLaunch. 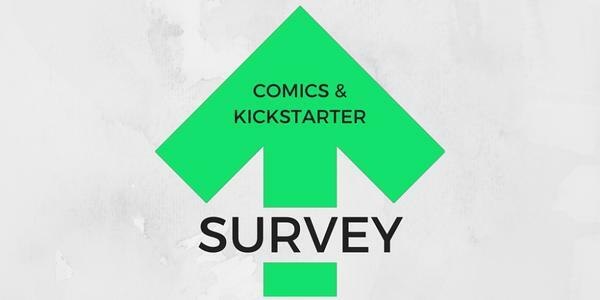 Before I get into that, though, I wanted to mention the ComixLaunch Survey. First, thanks to all of you who have taken it, and there are a ton of you who have. Jeremy and I are already taking action behind the scenes planning topics and future shows based on your responses. The survey is running until the end of the month Oct 31, 2015. We set a goal for the number of respondents and right now were’ about 2/3rds of the way there. If you’ve gotten value out of this show and want to see it continue and get even better, the single biggest thing you can do is take the survey. Also, remember there is a Bonus KS Training unlocked at the end of the survey that you won’t want to miss. Here’s Walter’s list of Questions for Tyler James… We touch on most of these! What would you say are the biggest factors that led to your phenomenal success with your last Kickstarter campaign? Is there one or a few things that stand out the most? 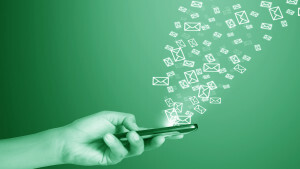 To Connect with Walter Haas, email him at [email protected]. Write down one idea from this episode that you’re going to take action on. Hey, guys! Before you go, I just want to remind you to head over tocomixlaunch.com/survey in order to take our first ever listeners survey. 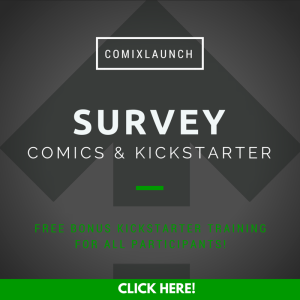 Everyone of you who completes the ComixLaunch survey will be given instant access to a private bonus ComixLaunch training! I promise you… it will be well worth your time, andcomixlaunch.com/survey is where it’s at. In this session with writer Ryan K Lindsay (Negative Space, Deer Editor), the topic is the pros and cons of digital only reward Kickstarter campaigns. This session will be especially valuable to creators outside of the United States interested in discover whether or not Kickstarter is a good platform for them. Purebuttons, your go-to resource for custom buttons of all shapes and sizes. Go to ComixLaunch.com/purebuttons for 10% off your next order of custom buttons. ComixTribe publisher Tyler James is joined by a special guest who is an up-and-coming comic book writer from the land down under, who has been steadily building an prolific body of impressive, thoughtful work, and whose career has really taken off this year. Comic fans and critics alike are raving of series “Negative Space” from Dark Horse. In the past four years he’s had work published by Image comics, IDW, Monkey Brain, Action Lab, SequArt, and more… And I’m thrilled to be working with him on a yet unnannounced new ComixTribe title that will be making big waves in 2016. Welcome to the ComixLaunch Podcast Mr. Ryan K Lindsay. Anything else you want to tell the ComixLaunch audience about yourself? I’m thrilled to have Ryan on the podcast today because I wanted his perspective on a topic that I’ve received a ton of questions on from ComixLaunch listeners… and that’s the viability, pros & cons, of “Digital Only” Kickstarter campaigns. In 2014, Ryan launched his first KS campaign for DEER EDITOR, a 48 tablet page B+W mature readers noir comic… that happened to feature an anthropomorphic deer as the lead. It was primarily a digital only campaign that exceeded its $1000 goal by more than 200%. We’re getting two for the price of one here with Ryan, because we get to talk about digital only campaigns… and running a comics Kickstarter outside of the United States. 1) To rewind the clock back to August of 2013 when Kickstarter announced it would be opening up shop in Australia… you’re a savvy comics creator, obviously backed KS before… what were your thoughts when you heard that announcement. 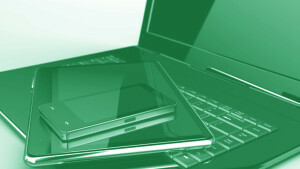 2) Why a Digital Only Campaign? What are the Pros and Cons? 3) Thoughts on what worked and what didn’t? …fantastically diverse in the way you can put things out there, and the way they will land. Some sort of element of lottery of surprise, that rewarded backers randomly for backing projects. We need more people getting into the door for KS. DropBox and Google Drive, Google Drive especially, because I can work anywhere and share easily and quickly. 4) Fulfillment is where even successful Kickstarter creators often drop the ball… Do you have a fulfillment tip for our listeners? Get all your emails off of Kickstarter and set it up in a spreadsheet instead. Don’t copy and paste one e-mail at a time. D4ve2 from Ferrier and Ramon. 1) Do you have one final piece of advice for INTERNATIONAL BACKERS on running a Successful KS campaign for the ComixLaunch listeners? Don’t be afraid to use your location as an advantage… play up the home-field advantage. Step up! 2) You have an awesome email newsletter… comes out every Monday, I’m a subscriber and I look forward to it every week… tell our ComixLaunch audience about it? Weekly Monday email, talking about comic process, Kickstarters, books I’m reading, and the week-to-week trials of breaking into comics! Hey, guys! Before you go, I just want to remind you to head over to comixlaunch.com/survey in order to take our first ever listeners survey. Last session, we detailed all the things that went wrong with the Archie Comics Kickstarter, and the major lessons creators should take from that failed launch. 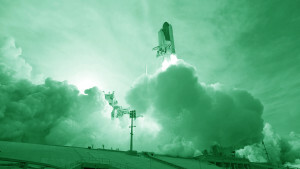 In this session, Tyler James and co-host Jeremy Melloul, rebuild the Riverdale relaunch Kickstarter from the ground up, and discuss ideas for crafting a more successful launch. Today’s Session is Sponsored by KrakenPrint. Visit comixlaunch.com/kraken and mention the show for 5% off your first print order. Something cool… The success rate for comics on KS went above the 50% mark… 50.1% to be exact. First time I’ve seen that! Number fluctuates, around that 50% mark for years… but as far as I’m concerned, no where close to where it can and should be… so we’re not resting on our laurels here… We’re DOUBLING DOWN! Obviously transparency & more realistic goal are two good things to do. 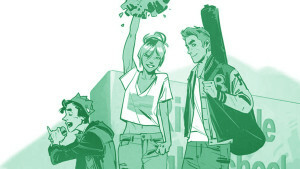 Come up with at least three ideas for what would you have done differently to build a better Archie Comics Kickstarter? Email us your ideas at [email protected] & [email protected] using subject line: ComixLauncher #12. and let us know… how would YOU have righted Riverdale? An alternate Kickstarter strategy: How Archie could’ve put together a successful campaign, based off Kickstarter best practices. If you’d like, you can download the entire 72-page eBook for free by pressing the button below. It’ll also get you signed up for the awesome Creator At Large Newsletter. Or, if you’re not convinced, you can click here to learn more about the eBook!